This past Saturday I made my way to Greek Peak. On this gorgeous sunny spring day I was excited to make my way to the slopes and explore this new mountain and all it has to offer. Skiing and riding at the end of March is always tricky because you never know how the conditions are going to be but there was plenty of snow at Greek Peak thanks to mother nature! Many skiers and riders headed to the slopes to take advantage of this great terrain. Beginners crowded the rental room, and the beginner area. Greek Peak is another mountain who participates in Terrain Based learning, with a few magic carpets and a beginner doublelift Greek Peak is a great place to learn, with their accommodating terrain and friendly staff you are sure to have a great experience. 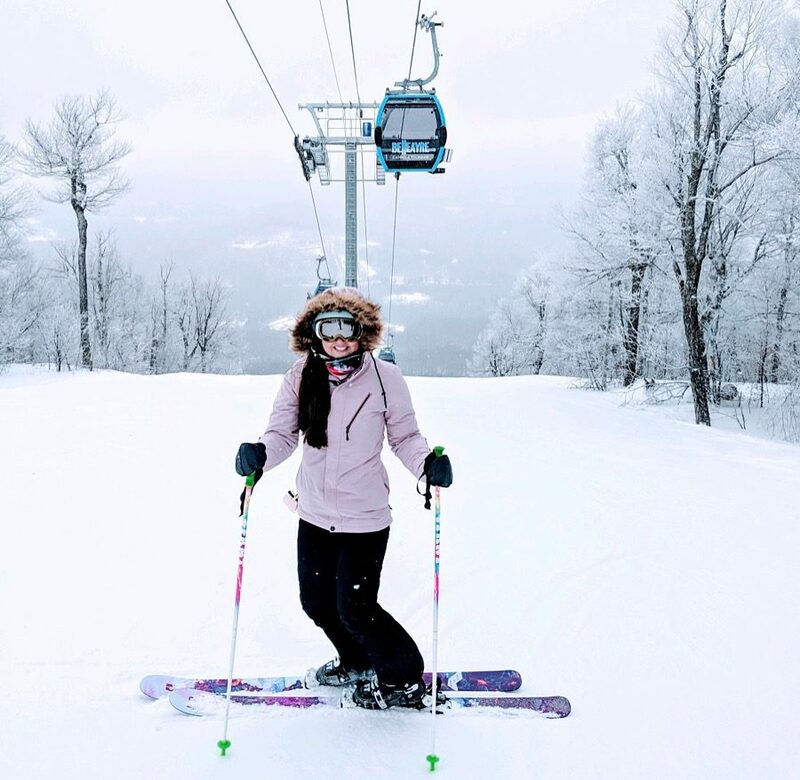 This visit was a little different for me, I had the pleasure of bringing along the College at Brockport’s Campus Photographer who filmed me skiing the mountain. As someone who has never skied for the camera before this was a totally new and exciting experience for me. I had an amazing time in a unique way. Greek Peak had some steep trails that I could really carve some turns on which I loved! Some of my favorites were Elysian Fields, Iliad and Karyatis Way. Greek Peak has a variety of beginner to expert trails and their steeps are great to shred. I also really enjoyed the view of the terrain park from the Visions Express Quad Lift, watching everyone show their tricks while on the lift was definitely entertaining! Greek Peak is not only a ski mountain, but also boasts a tubing park and an indoor water park at the resort. A winter family vacation here has something for everyone! Hurry up and book a trip before the snow is gone! When I met with Jessica from the Marketing and Sales Department, I really got the feel for her love of the mountain. She mentioned to me how the ski season has been great and they were on their 107th ski day of the season on Saturday and are hoping for more…as we all are! They also plan to improve and add more snow making for next season, which sounds like a plan to me! In the meantime I’ll be hoping for more beautiful ski days and maybe some more snow this April!